Rupert Murdoch’s recent multibillion-dollar purchase of the Wall Street Journal made international news. 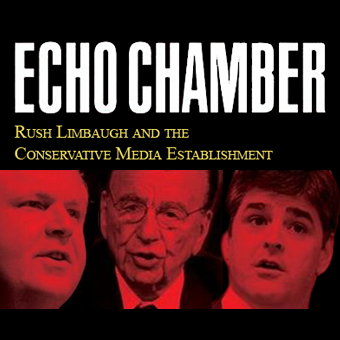 Yet it is but one more chapter in an untold story: the rise of an integrated conservative media machine that all began with Rush Limbaugh in the 1980s. Now Kathleen Hall Jamieson and Joseph Cappella—two of the nation’s foremost experts on politics and communications—offer a searching analysis of the conservative media establishment, from talk radio to Fox News to the editorial page of the Wall Street Journal. Indeed, here is the first serious account of how the conservative media arose, what it consists of, and how it operates. This thoughtful study offers the most authoritative and insightful account of this revolutionary phenomenon available today. Get The Echo Chamber. Available now from Oxford University Press.